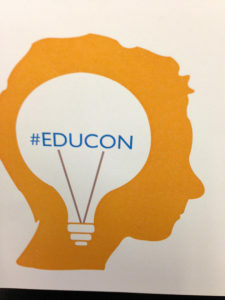 Every year I look over the schedule for EduCon and I mark everything I want to attend. As a result, I end up with two or three or four sessions marked at each time slot. What I manage to forget every year, and that seems absurd by the 11th year, is that my brain is swimming by the final session each day. On Saturday there is an opening keynote, a morning session, lunch with Ignite-style presentations, and then two afternoon sessions. Each session is 90 minutes long and is full of conversation. So by the final session of the day I am mentally exhausted. This conversation explores a more capable and compelling three dimensional model of learning that supports the development of a new school learning experience that supports the manifestation of communities of participatory and engaged learners. Traditional thinking in schools relies on lifelong learning – a linear progression of learning over time, composed of formalized experiences (limited and occurring within the traditional experience of school) and informal learning events across that same timeline and throughout the lifespan. There are opportunities to rethink this model by adding breadth (life-wide learning) and depth (life-deep learning). Life-wide learning focuses on learning that positions students to engage in a wider range of experiential moments that broaden exposure to more authentic opportunities for learning. Life-deep learning focuses on developing the beliefs and skills of the human self, such as developing an empathetic approach to interactions with others, being reflective, and contributing to the greater good, among others. The intent of this conversation is to explore how these three dimensions for learning support the development of capacity-rich, participatory, and distinctly human communities of learning. Can you see why I was concerned? It was worth the effort though. We discussed what it means to be a life-long learner, a life-deep learner, and a life-wide learner. Just beginning to define these ideas for myself was fascinating. Talking with the three other folks at the table about examples of these ideas, how it might look in and out of school, and what we can do to encourage all three types was wonderful. I’m not convinced the system of schooling, the way school is designed to work, does a whole lot to foster any of these three. We’ve set so many parameters and limitations on what students can and must learn and explore that we have removed all of their independence and we are actively discouraging curiosity. My own daughters are in the process of choosing their classes for next year, for 11th grade and 7th grade. More than half of their day is set, not a choice they get to make. They will take a math, a science, an English, and a history/civics. Even within those categories they don’t have much in the way of options – mostly just whether they take them honors or not. The younger one will also take P.E. If they are interested in those classes this works well. If not, oh well. I’m not going to spend a lot of energy addressing that challenge as middle school and high school are not areas I know well. However, elementary is definitely in my wheelhouse. We offer kids a relatively wide education at the elementary level as they get the core content and a range of arts and P.E. Which isn’t to say we couldn’t do a whole lot better. But I think life-wide is probably our area of greatest strength. Even if it would fall short of ringing the bell on high striker at the carnival. Life-long is definitely not built into the system but is something I believe teachers work toward regularly for their students. Again, it may not be something we do anywhere near as well as we should but I think it is something we are doing and trying to do well. Life-deep is an area that I don’t think is even on our radar. It should also be noted that I don’t think school can or needs to do all of these things well for every kid all the time. I do think we should be thinking about all three and making sure we are offering our students the skills they need to be able to be all three kinds of learners with and without us. Thank you, David Jakes and Karina Ruiz, for keeping me thinking.